At some point in life we are told, or find out through mysterious processes, that hiking in hard and thus flatter and plainer trails where walking doesn’t require thought become preferred. This transition must come around the time our brains become complex enough, and our well of memories deep enough, to make daydreaming an option for real entertainment. 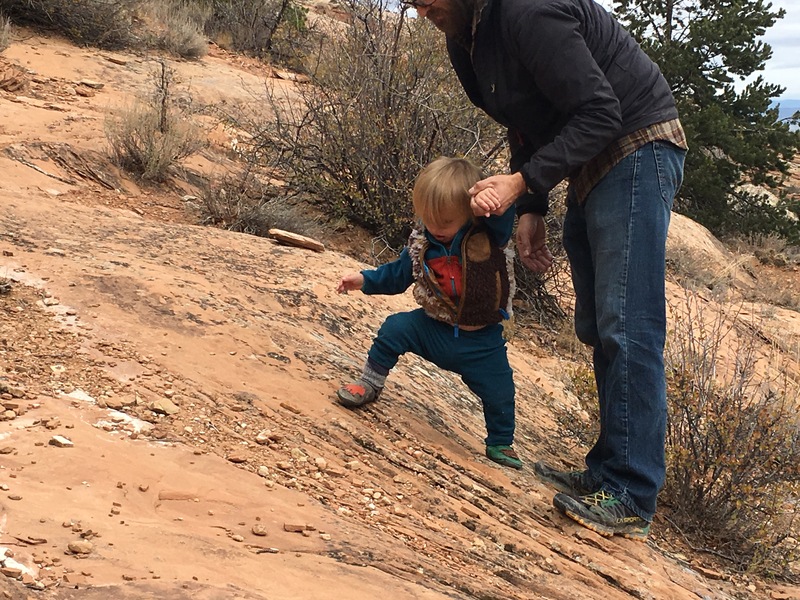 What’s been made clear to me, over the past six years of watching elementary-aged kids, and now a toddler, learn to hike is that in the beginning flat trails are the enemy, that steep and rugged are synonymous with entertainment. I had a most vivid lesson in this a few days ago, on a very short hike with Little Bear. First first half wandered down a broad sandy trail across a wash, and the second half climbed a few hundred vertical in 1/3 of a mile up mixed slickrock ledges. For months I’ve been taking LB on packless hikes, where the goal is for him to walk as far and long as he cares, and me with no mechanical assistant for carrying him in the name of efficiency or impatience. Most of these were flat hikes in Glacier, and while LB would put in solid miles (or mile) every time, this was usually spent going back and forth between interesting signposts, leaves, and tree trunks. Investigating things was the goal, with priority given to any water, anything red, or anything loud. Walking was an incidental means to an end. The slickrock hike was different. He charges full tilt up the fall line, for the entire distance. Through spotting, and hand holding to repeatedly get him back on line, I got tired before we reached the top, but reach it we did, with plenty of energy to run around the rock bowl at the summit. I’ve never seen him so interested in getting one place for so long, and see no other explanation but that the process was more than interesting enough. Seeing his problem solving procedures is fascinating. 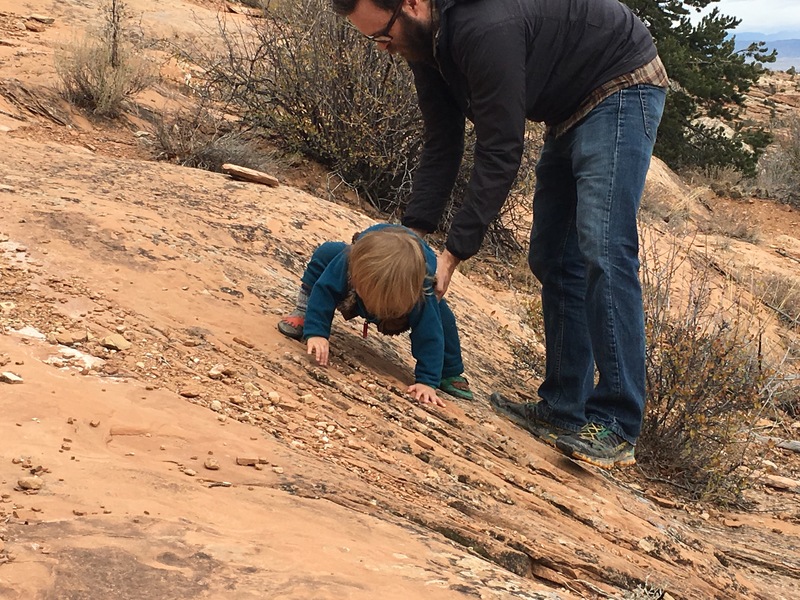 His toddler’s big head, long torso, and high center of gravity make things like getting friction on rock more complicated than it would be for an adult, resulting in solutions like the sideways crabwalk shown above. It’s another reason we’re glad to be in canyon country, land of funny walks. Don’t children always try climb slides on the slide side?